The visit of a delegation from Kazakhstan on 29 June was the occasion to discuss opportunities for joint research activities made possible by an Agreement concluded last year between the ITER Organization and the Kazakh National Nuclear Center. Looking out onto the ITER construction site are ITER's Director-General Bernard Bigot; Erlan Batyrbekov, Director General of the National Nuclear Center of the Republic of Kazakhstan; Mario Merola, head of the Internal Components Division; and Alexandr Vurim, Deputy Director of the branch Institute of Atomic Energy (IAE) for reactor tests. One year ago, on 11 June 2017, an important event took place in in Astana, Kazakhstan. During the Ministerial Conference on Securing Sustainable Energy Development, held before a large gathering of delegates and media representatives at the EXPO-2017 Congress Center, the ITER Organization officially welcomed the National Nuclear Center of the Republic of Kazakhstan (NNC-RK) as a new technical collaborator and a Cooperation Agreement was signed. The Agreement opened the way to accessing Kazakhstan's IVG.1M and WWR-K fission reactors, the KTM tokamak for materials testing, the exchange of technical experts, and the development of diagnostics for ITER. On the occasion of the one year anniversary, Erlan Batyrbekov, Director General of NNC RK, and Alexandr Vurim, Deputy Director of the branch Institute of Atomic Energy (IAE) for reactor tests, visited the ITER Organization. The visit on 29 June also celebrated the signature of the first Implementing Agreement on "Radiation resistance tests of fibres and fibre optic sensors under ITER-relevant nuclear irradiation," which defined the details of the technical collaborative work in that area (see related article in this issue). 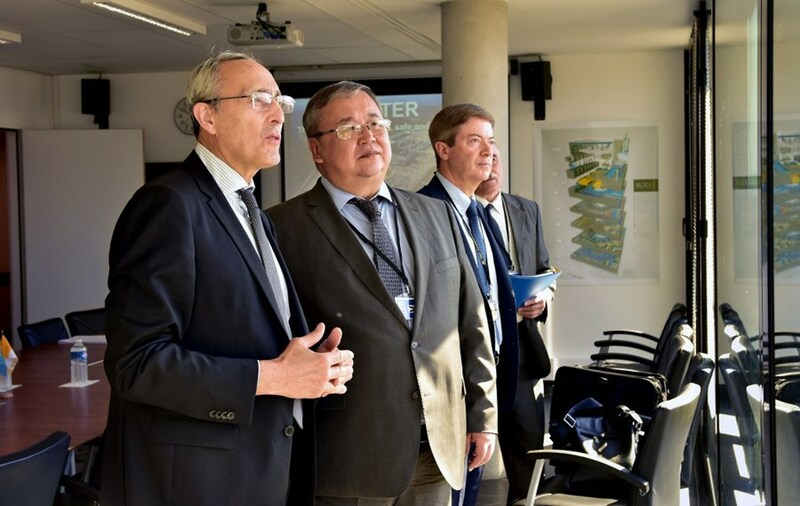 Bernard Bigot, Director-General of the ITER Organization, welcomed the Kazakh delegation and presented the status of ITER, while Erlan Batyrbekov gave an overview of the activities carried out by NNC RK. "The visit was an excellent opportunity to strengthen the relation with our Kazakh partners. Exchanges on their technical capabilities and ITER technical needs were instrumental to identifying areas of possible further collaboration," said Mario Merola, Head of the Internal Components Division and ITER Lead Responsible Officer for the implementation of the Collaboration Agreement. "The first technical collaboration has already started and we paved the ground for possible further future joint activities."